Over the weekend Kickstarter chose We Make Seattle as a staff pick, helping boost us a few more percent of the way towards our goal. We’re thrilled to announce that Nick Finck has signed up to be our second Silver Sponsor, contributing $2500 to the We Make Seattle Project. Thanks Nick for helping support us and the city of Seattle – you’re awesome. Who will be next? I hope it’s you. Maybe the person next to you? Or perhaps you’ll share our project with your team, or your boss? We’d be grateful. We’re thrilled to announce that Jackson Fish Market has signed up to be our first Silver Sponsor, contributing $2500 to the We Make Seattle Project. Thank you guys for helping support us and the city of Seattle – you’re awesome. Who will be next? I hope it’s you. Maybe your coworkers want to get together? Or perhaps you’re a leader in your organization and can step up for your company, and for Seattle? Kickstarter Update: $6k (23%) and climbing on Day 1! Thanks to all of you for tweeting and Facebooking word of our project. If you haven’t yet, now is a great time as our kickstarter campaign is still only a few hours old. 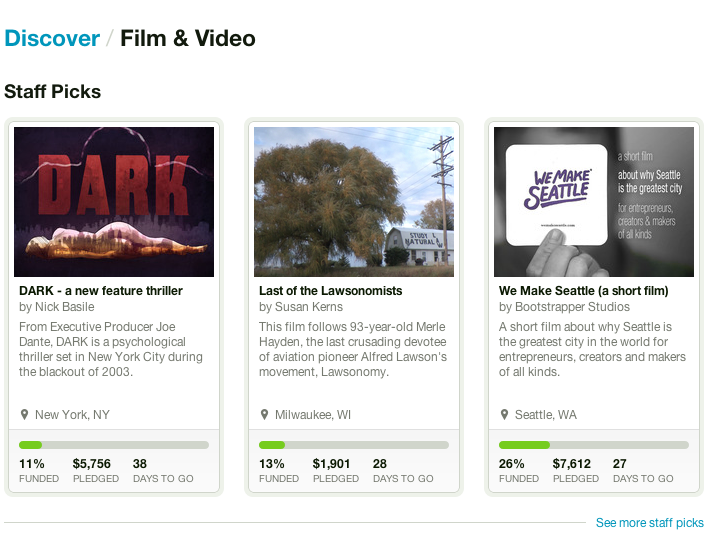 And to our 30 supporters so far, we can truly say, you have helped make We Make Seattle. If you work for a large Seattle corporation or organization, please consider reaching out inside for Silver, Gold or Platinum sponsorships. Having a major sponsor as a backer will go a huge way to make sure this project happens. Thanks for your help and please spread the word. Hi folks. Our kickstarter campaign is now live! Please head straight to our campaign page and jump in. Any support you can lend will be greatly appreciated. Spread word to your coworkers and friends – we’re looking for silver and gold sponsors to help lead the way to funding and you might be our key link for making this project happen. 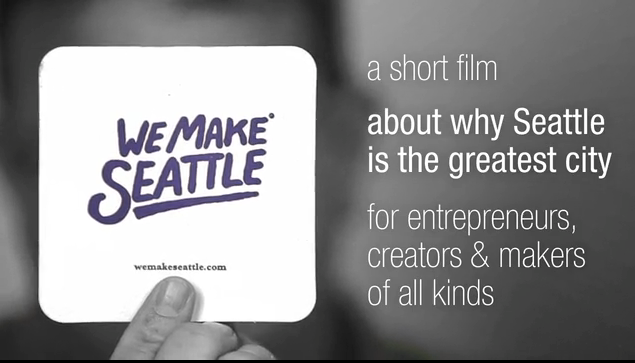 We’re creating a short film to show the world how great Seattle is for creatives and entrepreneurs who have big ideas and the passion to invest in them. Outside of the Pacific Northwest, little is known about what makes Seattle a great city for creatives. Despite recently being rated the #1 tech city in America by The Atlantic, most of America knows little about why they should bring their ideas and businesses here. Our goal is to lead a community driven PR campaign, centered on a short film, to raise our profile to where it belongs among America’s great cities for people with big ideas. The film will be something local creatives and entrepreneurs can use to recruit talent, co-founders and resources. Larger companies can use it to help convince recruiting candidates to move to the Northwest. And for those who simply love living in the Emerald City, it will be a fun and entertaining way to convince smart friends and ambitious creatives from around the world to bring their passions here. Our kickstarter campaign raised $30k and is set to launch spring of 2016. For now please follow us by email, Facebook and Twitter and spread the word. Thanks.